Often when we think of the Bay of Islands, water adventures and chilling out on an isolated beach come to mind. All very appealing of course, but why not consider adding to your holiday memories by embracing a relaxing walk in Paradise too? With help from locals, the Department of Conservation and travel blogs, we’ve gathered a list of the top walks in and around the Bay, for all fitness levels. We’ve covered a bunch of options – easy short day walks, then some longer ones; overnight tramps for the more adventurous and some extra special Kauri forest walks a tad out of the region (but well worth the trip). We’ve even thrown in a waterfall or two! We hope this post inspires you to explore. We guarantee nature will serve up a pleasant surprise! As they say, leave only footprints and take only photographs. If you’re heading off the beaten track please consider a thing or two when it comes to conservation, and make sure to check your gear for pests (like rodents, insects), and making sure footwear is clean from soil and seeds. If you’re not up for a huge hike and just want some fresh air or a new perspective, take one of these easy walks. Key features: Native bush, birdlife. This walk offers a small taste of some of the best native forest up here. It takes you from Broadview Road, Opua down through a lovely valley to join up to the Paihia to Opua walkway. A great feature of the walk is the old native puriri trees everywhere (with red berries above). This tree can grow to 20m high and its pretty pink flowers can be seen for most of the year. It’s related to the teak tree and its hard, reddish-brown timber was popular with early settlers for railway sleepers, fence posts, house piles and bridges etc. It was so hard to split that timber workers often resorted to dynamite. Maori have used infusions of puriri leaves to bathe muscular aches and sprains and as a natural remedy for sore throats and ulcers. 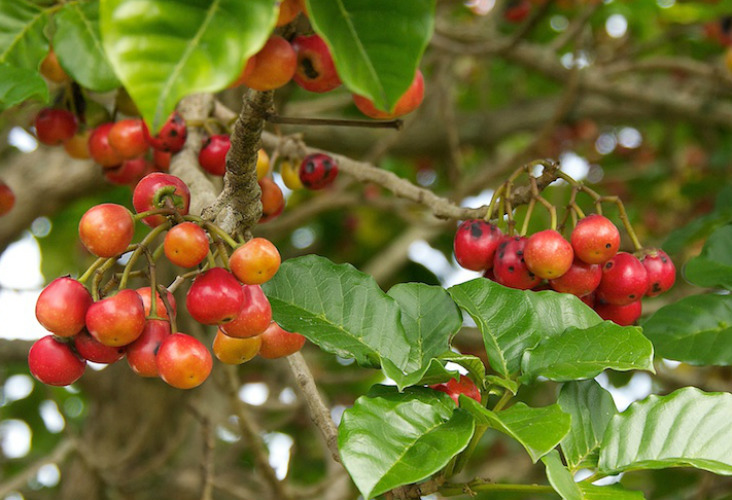 But please do not eat the berries – many native plants can be poisonous! Key features: Beaches, rocky headlands, views, birdlife, history. An ideal time to do this popular coastal walk is early in the morning – not in the middle of a hot day, as it’s exposed to the sun. From the Visitor Centre, facing the sea, turn left and simply follow the waterfront. You can follow the road above the headland or walk along Te Ti Beach if the tide is low. 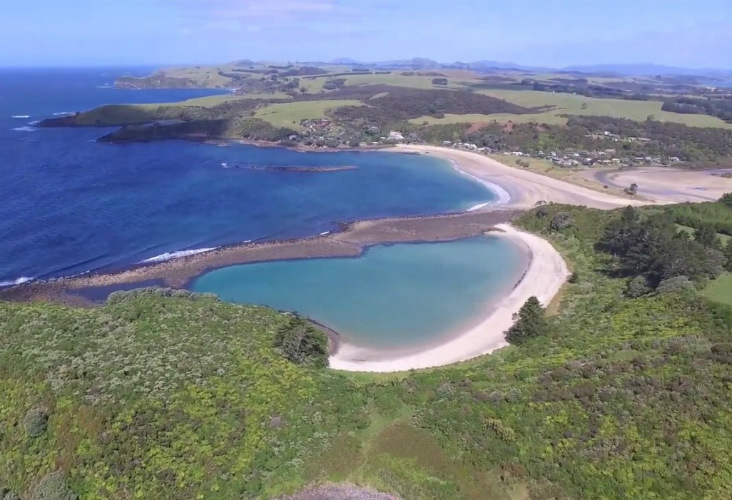 At the northern end of the beach to the left, you’ll pass iconic Te Ti Marae. It was here that Maori chiefs sat and pondered overnight, considering whether to sign the Treaty of Waitangi, NZ’s founding document. The rest is history, for the next day is when it was signed it at Waitangi, on 6 February 1840. As you cross the Waitangi River bridge you’ll see the sailing ship ‘Tui’, converted into a shipwreck museum and café housing some of the interesting treasure recovered by celebrated NZ marine archaeologist, Kelly Tarlton. The ‘Tui’ was also used as a sugar lighter for the Chelsea Sugar Refinery in Auckland, as well as a houseboat. Starting point: Paihia (or Russell, and reverse the journey outlined below). Key features: Beaches, views, history, bush, birdlife, on-the-water fun (via ferry). This route is a great way to introduce yourself to the area. It includes walking a track from Paihia to Opua (2 hours via beaches and mangroves), catching the ferry to Russell, then walking Okiato to Russell on the other side of the Bay (bush, coast, and a decent hill) and returning via ferry. You’ll head through a variety of landscapes; from the white-sanded coast, across boardwalks, through beautiful mangrove swamps, into the dense native bush, tackling some hilly terrain and then be rewarded with stellar harbour views. Plus, on your journey, you’ll see a number of historic points of interest. Once you’re on the Russell side of the Bay, your walk from Okiato to Russell township encompasses a mixture of flat stretches and a steeper hike through some native bush. Overlooking Orongo Bay you’ll see the historic manganese mine. You’ll even stroll via oyster farms and vineyards – you will have earned a treat by this point, so schedule a stop off. 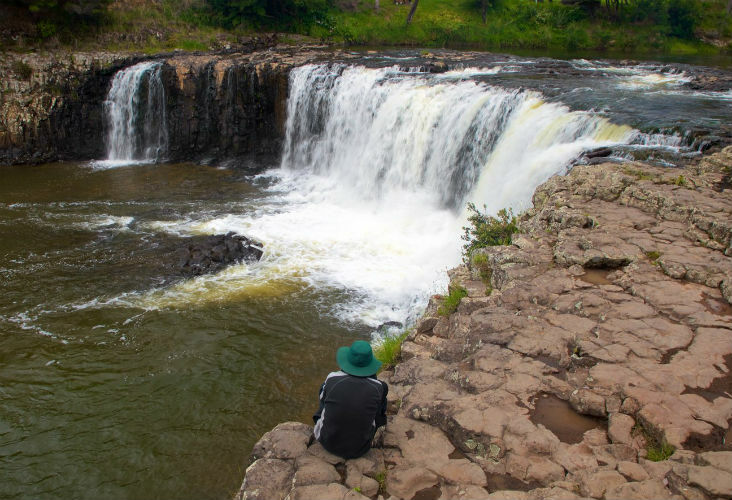 Some people take over-night gear and stay in Russell, there are heaps of things to do and see here – read our blog on it. Grab information sheets and a map at the local information office (iSite in central Paihia) for more detail. Starting point: School Road, Paihia, 700m from Paihia township. Key features: Birdlife, wetlands, native bush, views. 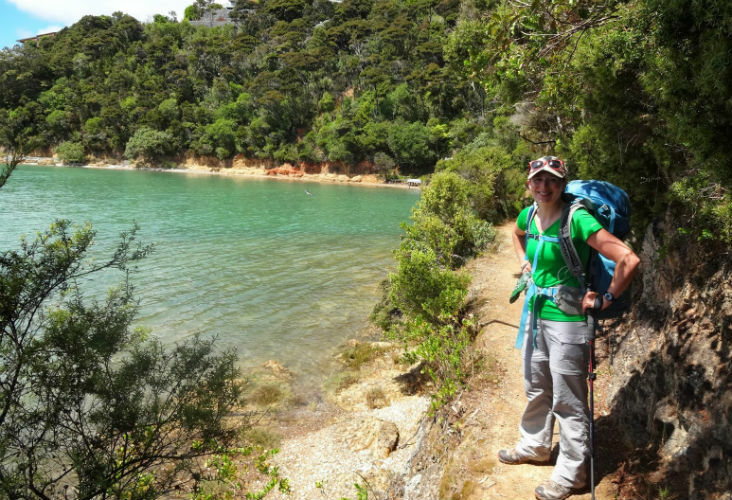 If you’re based in Paihia this walk is a short, convenient must-do! Stroll along a well-maintained track through wetlands before climbing up through the regenerated native forest to a lookout point high over Paihia’s township. Keep an eye out for native birdlife as you stroll. Views reach from Opua out towards Waitangi and Paihia township, over the water to Russell. Beautiful! Key features: History, bush, birdlife. And views, views, views! We recommend all able visitors to Russell take a walk up to Flagstaff Hill, the highest point in Russell. The 360-degree views over the Bay are just outstanding. See the iconic flagstaff up the top, chopped down four times by local Māori (including the famous chief Hone Heke) in opposition to British rule. If it’s low tide, you can start this hike by walking to Kororareka Bay, around the rocks to Watering Bay, where a marked track starts. You’ll then head through some beautiful native forest and out onto Titore Way. On the right after 300 metres, there’s another track up to the summit. It’s all signposted. If it’s high tide, walk along The Strand in Russell and through Kent Street, and then Wellington Street. About 300 metres up the road is the entrance to the bush walk that connects with the low tide option above. Or a shorter option is to continue up to the end of the street where there’s a bush track up to the summit. Key features: Swim in clear blue water, views, bush. Long Beach (Oneroa) is an awesome swimming beach with white sand and views out to the islands, and is the favourite for locals. So it’s certainly a popular spot for a dip, but foot traffic is still limited don’t worry. Check out our beach guide for more info. The quickest route from Russell ferry to Oneroa is to take the ‘Long Beach Walkway’. Starting at The Strand, go down Kent Street and follow Long Beach Road to the camping ground. Follow the paved walking track you’ll spot to the left. You’ll walk through native bush and climb over a fairly easy hill (passing the local cemetery which is an interesting, historic stopover), then down to the hill to the coast. Easy as. 1 hour 20 (40 min each way). 1.1km one way. Starting point: Head along Purerua Rd and then Rangihoua Rd. Turn onto Oihi Rd and drive 2.8km to the car park. Key features: History, beaches, views. Rangihoua Heritage Park was officially opened in December 2014, on the bicentenary of the first missionary settlers’ arrival in New Zealand. Māori lived in this area for centuries before the missionaries arrived. In December 1814, Reverend Samuel Marsden arrived in the Kerikeri Inlet in by ship, and two days later celebrated Christmas here. 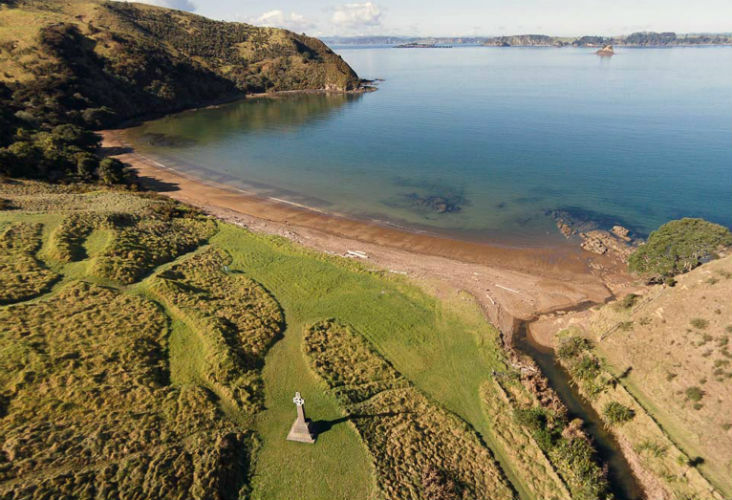 There is an area near the coast with a large carved stone cross, marking the place where the first Christian church service in New Zealand was held. 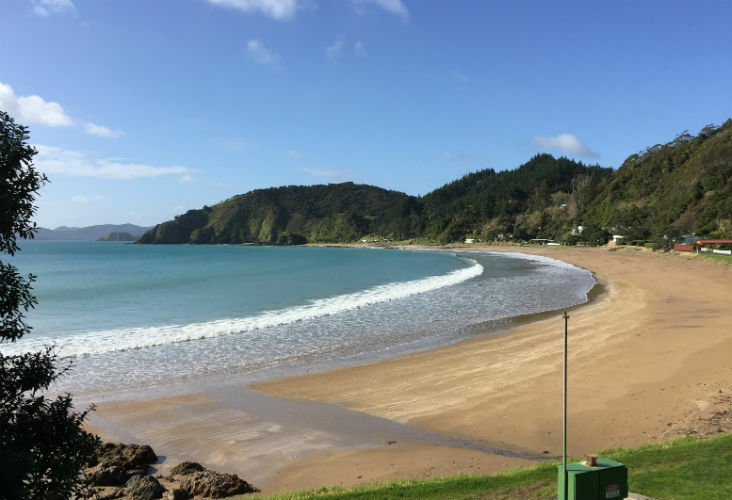 This is a great short walk to see some key Bay Of Islands and New Zealand history. Walk across farmland with a beautiful vista across the coast. Starting point: Signposted from Rawhiti-Ngaiotonga Rd (From Russell, take the Russell-Whakapara Road for 13.8 km and turn off at Kempthorne Road. Follow the road through Parekura Bay, continuing on to Manawaora Road. At the top of the road, turn left onto Rawhiti Road). Key features: Wetlands, coastal forest, birdlife, history, beach. The Whangamumu Harbour is breathtaking and worth travelling north for. This historic track takes you on the exact path of early 20th century whalers that set up shop in and around the region. At one end you’ll find the remains of one of the last surviving shore-based whaling stations in New Zealand. It’s an easy walk for the family. A track continues from the whaling station around the coast, joining up with the Cape Brett track. Key features: Farmland, bush, birdlife, beaches. This walk on the Purerua Peninsula, is only 30 minutes north of the Bay and takes you to the quaint Taronui Bay. The only way to get to this beach is on foot so it’s quite the hidden gem. Just follow the signs. There are over 144 islands in the Bay of Islands. 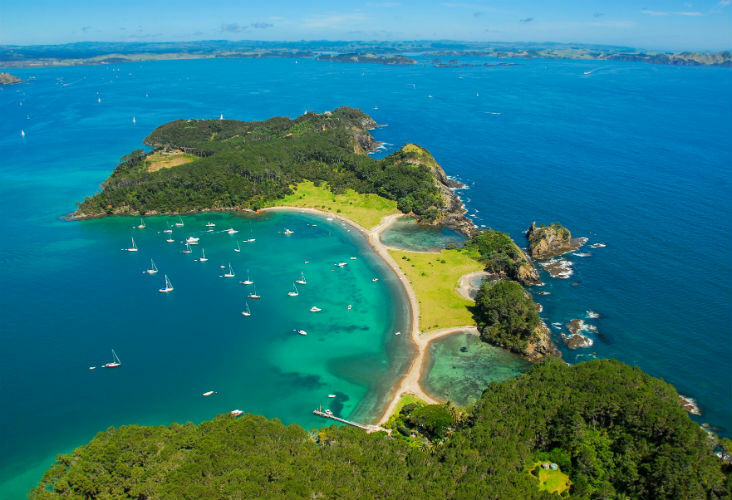 The stunning beaches and walks that stud these coastlines are only accessible by boat or helicopter – some via kayak or water taxi from Paihia. If you’re kayaking to an island from the ‘mainland’ please make sure you are experienced and that you double-check distances and conditions. The weather can change dramatically when out on the open sea. Your best option may be via a local guided kayaking tour – here are some options for tours and kayak hire. Here are a few island walk options that are popular, accessible, and of course, jaw-dropping in terms of scenery. Have a good look at our listings to find out how to island hop by boat. 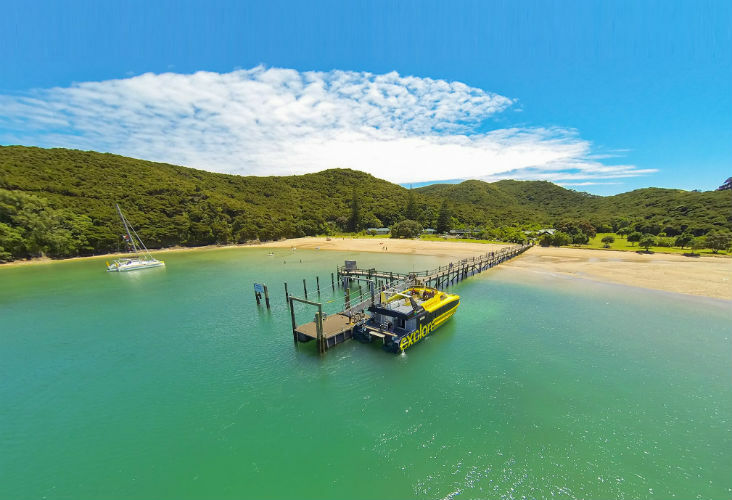 Starting point: You can access from many of the Bays on the Island – although ferry starts from Otehei Bay. Key features: History, beaches, water sports, bush, birdlife, wetlands. This beautiful island is of significant historic and cultural importance. Plus it offers visitors a great place to escape and enjoy fun water sports (you can hire equipment near the ferry drop off). There are a number of walks across the Island but this is one of the most popular to do. It’s an awesome way to learn about the area as there are some interesting archaeological spots along the way. A large Māori community once lived here, and you can even see the remains of fortified Māori villages. The hike is designed in a clockwise direction and runs near most of the larger beaches. So if you’re on the walk on a sunny day you can dip in and dip out at the various bays – literally! There are some campsites on the island (book on the DOC website), and a cafe at Otehei Bay where the ferry lands. Fullers GreatSights offer an excellent Island Adventurer Cliffs & Caves cruise. Starting from Paihia you’ll get a two-hour cruise of the interesting parts of the Bay and stop off on another island for a wander, then land on Urupukapuka and spend the day exploring. You can get picked up at lunchtime or at the end of the day – it’s up to you. Starting point: Access by boat, ferry or kayak. Key features: Views, beaches, lagoons, bush, birdlife. 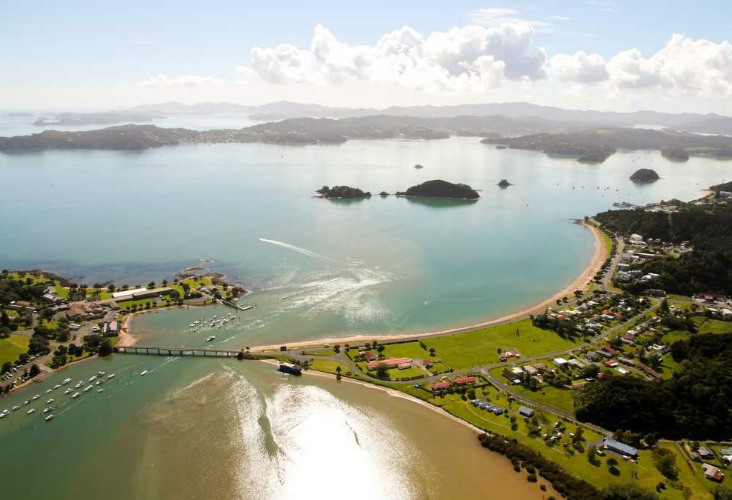 The island closest to Paihia is Motuarohia, famous for its two glorious lagoons and view from the top point. If you’re OK with walking uphill (350 metres up) we’d suggest heading to the summit. Once there you’ll be treated to spectacular views of the Bay of Islands. Bring your camera! If you have a day up your sleeve and some decent walking shoes, consider a longer walk. Key features: Waterfall, bush, birdlife, history. This beautiful track starts at the historic Kerikeri Mission Station and follows the banks of the Kerikeri River up to the Rainbow Falls waterfall. You can hear the sounds of native birds like tui and fantails as you walk through bush and beside the river. There’s also a shorter walk option, starting from the Rainbow Falls car park and picnic area at the end of Rainbow Falls Road. This option is only around 400m long and is even wheelchair accessible. Take your togs and leap into the swimming hole below after your walk. Before you head off on the walk, or once you’re done, we’d recommend exploring the historic Stone Store and Kemp House. 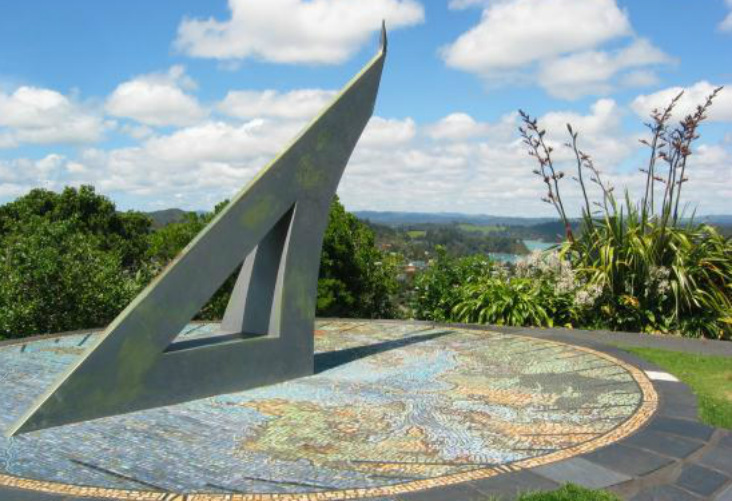 Check out our blog on what to do and see in Kerikeri for more on this, and the surrounding area. This walk starts at the historic Waitangi Treaty Grounds and takes you up to the stunning horseshoe-shaped Haruru Falls. The walkway skirts the Waitangi Golf Course then follows the Waitangi River through native bush. Most of the walk runs along a boardwalk through a mangrove forest. 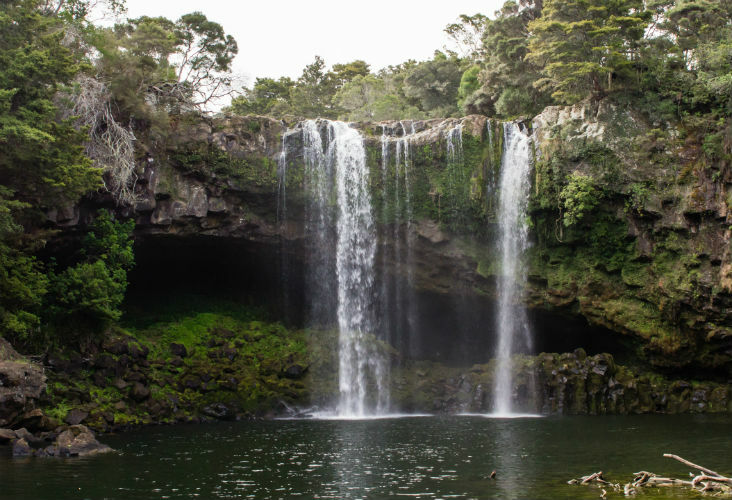 Haruru Falls refers to both the breathtaking waterfall, and a small, historic settlement nearby, about three kilometres inland from Paihia. Haruru means “big noise”, and the waterfalls in a rare horseshoe shape. Maori legend says that a taniwha (water monster) lives in the lagoon below the spectacular falls. Let us know if you spot him! The hike we’ve featured here is the hero of Bay of Islands walking trails. 2 days (8 hours each way). 16.3km total. Starting point: Oke Bay, Rawhiti, (26km from Russell). Key features: This stunning hike has a bit of everything! You’ll need to be fit to manage two days, plus the terrain can be a challenge in parts (there are some bluffs and steep cliffs), but you’ll soon discover why people come from all around the world to do this hike. 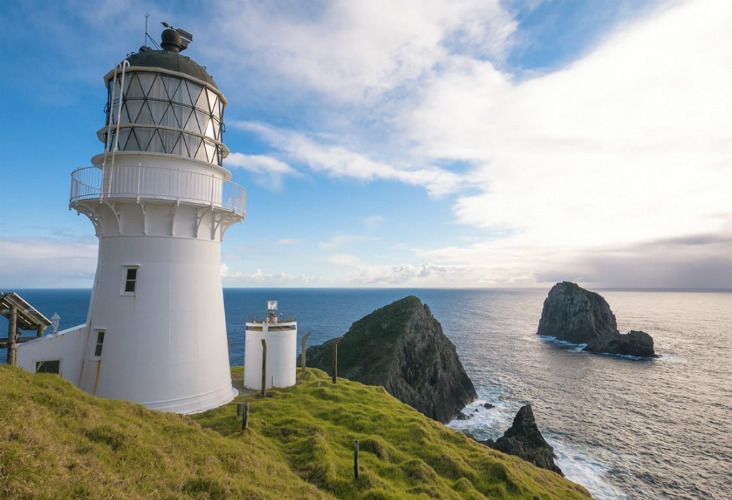 The trail leads along the Cape Brett Peninsula all the way to its coastal point, marked by the historic Cape Brett Lighthouse. There are many post-card moments to this walk but this spot is the most iconic. Since 1910, the lighthouse has lit and protected the coast for seafarers. You’ll pass by beautiful beaches, along the ridge of the cape, through Māori-owned land and also DOC land. En route you’ll enjoy incredible views, native forest and birdlife, and many walkers spot dolphins, whales and seals. You’ll need to book ahead to stay the DOC hut overnight. You can do this in advance via their website. Important: There is a track fee for a portion of the walk that runs over someone’s private land. You can pay track and hut fees at the Paihia i-SITE (just opposite our booking office). The Waipoua Forest is a 2-hour drive from Paihia. But it’s a beautiful drive across and you’ll be rewarded by your efforts. 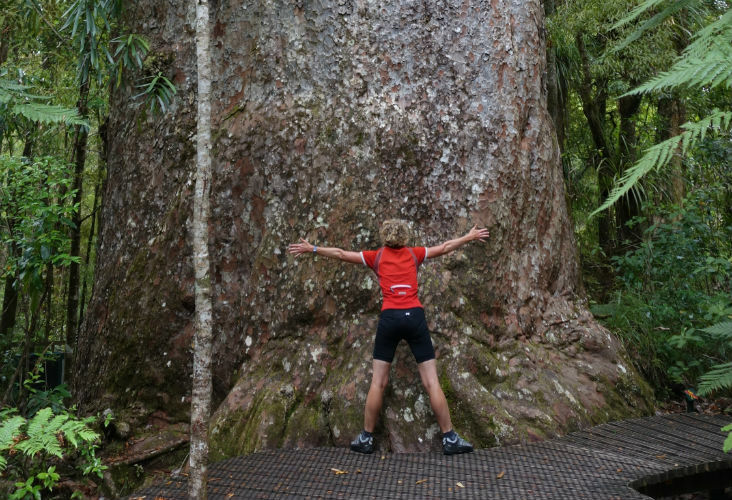 The tallest NZ tree, standing at an epic 150 feet high, is the treasured Tane Mahuta (‘Lord of the Forest’), a Kauri tree. In the shadow of these giant trees lives our national icon, the kiwi. To hear their call you will need to venture into the forest at night, Footprints Waipoua offer guided night walks into this ancient spiritual wonderland. We’d recommend this as a great family experience. The Puketi Kauri Rainforest is a 35 minute drive from Paihia, 20 minutes from Kerikeri, and a 10 minute drive from the Bay of Islands airport in Kerikeri. Along with its neighbour the Omahuta Forest, it forms one of the largest tracts of native forest in Northland. Kauri are treasured giants. Standing underneath such ancient, magnificent stature will leave you breathless. Most tracks around these forests are all-weather tracks, and can cater for the less able or time poor with a 10-minute Kauri Boardwalk, right through to a hardy two-day hike. Find a guided tour option here. And DOC has a great list of all of the walks available in the forests here. Whether you’re planning a short walk or a longer hike, it’s really important you’re well prepared in case of changes in the weather, or the unlikely event that you get lost. Always double check weather conditions before you leave. Wear comfortable walking / hiking shoes. If you haven’t worn them in, take plasters just in case! There’s nothing worse than a blister and a long walk home. Take plenty of water and food. Walking can be thirsty work, even if the terrain is flat. Wear a hat and bring heaps of sunscreen. The NZ sun is extremely strong (burn time can be as fast as ten minutes in summer months). Keep applying sunscreen during the day especially during summer as you sweat or swim. Pack a windproof and waterproof jacket. Even if it’s sunny, the weather could change. Never smoke or light fires, especially in the bush or dry scrub areas. Follow all instructions and signage that you see on a trail. If you’re visiting any of our precious islands or forests, help us keep them pest free by bringing clean shoes and checking for stow away creatures in back packs. There are plenty of protected flora and fauna up here. Charge your mobile phone. There will not always be coverage but it’s just in case of an emergency. Then we’d suggest turning it on silent, to enjoy the serenity. If you’re parking, make sure your vehicle is locked and valuables out of sight. Most importantly – take a deep breath in and enjoy the sweet scent of nature!